And he said it wouldn't last. 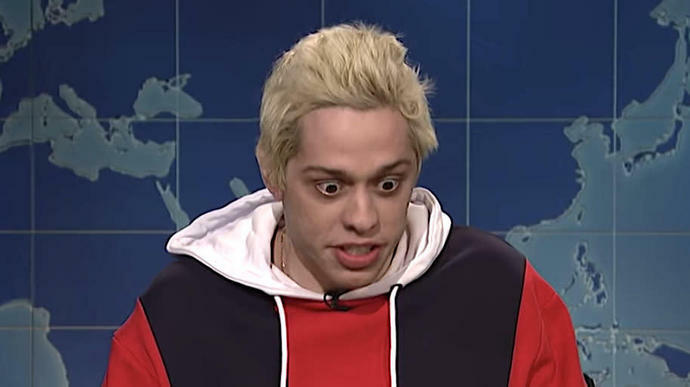 Well, Pete Davidson joked about a possible breakup with Ariana Grande on "Saturday Night Live" two weeks ago. Funny (or not) how those words with Colin Jost on "Weekend Update" may have come back to haunt Davidson now that the "SNL" comedian and the pop star have reportedly called off their whirlwind engagement, though they are still "working things out," according to an Us Weekly source. In the faux interview between Jost and Davidson, Jost asked about a possible prenup. "God forbid we split up, and she takes half my sneakers," Davidson jokes around the 1:40 mark in the video above. "I'm totally comfortable being with a successful woman. ... I live at her place. She pays, like, 60 grand for rent and all I have to do is, like, stock the fridge." In the same bit, Davidson said he had switched Grande's birth control pills with Tic Tacs. "I believe in us and all, but you know, I just want to, like, make sure that she can't go anywhere," he said. The comic wasn't done addressing a possibly broken future with the "God is a Woman" singer. In noting that Grande named a song for him on her new album "Sweetener," he said: "You know, I don't even get royalties for that 'Pete Davidson' song? You know that? Like, if we break up, and we won't - we will - but we won't. But like in 10 years, if God forbid that ever happened, there will be a song called 'Pete Davidson' like playing in speakers at Kmart, and I'll be working there." Grande was scheduled to be the musical guest on the same show but reportedly dropped out for "emotional reasons" after her ex-boyfriend Mac Miller died of an overdose. "SNL" producer Lorne Michaels did not elaborate on Grande's reasons for backing out. Kanye West took her place.